Tutorial assistance is available to help you pay for tutoring necessary to advance your education. This is a supplement to your regular education benefit. Tutorial assistance is available if you are receiving VA educational assistance at the half-time or greater rate and have a deficiency in a subject, making tutoring necessary. 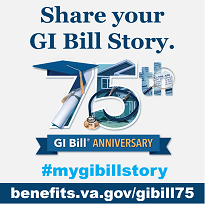 There is no entitlement charge for the first $600 under the Montgomery GI Bill. There is no entitlement charge under the Port-9/11 GI Bill or DEA. The student must be in a postsecondary program half time or more. For the Post-9/11 GI Bill, rate of pursuit must be at least 50 percent. The student must have a deficiency in a course that is part of his or her approved program. The student must be enrolled in the course during the quarter, semester, or term in which the tutoring is received for the course. Tutoring may not occur between quarters or semesters. The student, tutor, and certifying official must complete VA Form 22-1990t, Application and Enrollment Certification for Individualized Tutorial Assistance. The application may be submitted at the end of each month or combination of months. The application must be signed and dated on or after the date of the last tutoring session certified. Tutoring is essential to correct a deficiency. A letter from the course instructor should be put in the student’s VA file stating that the student is deficient in the course and that individual tutoring is required to correct the deficiency. The tutor meets the college’s qualifications. Ideally, the school maintains a list of approved tutors. The list should indicate the subjects a tutor is qualified to tutor and the hourly charge. Students should be assigned a tutor from the approved list. A tutor may not be a close relative of the student.